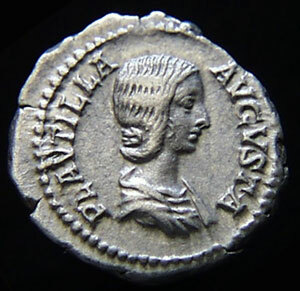 Plautilla was dauther of Gauis Fulvius Plautianus, the influential Praetorian Prefect under Septimius Severus. Her marriage to Caracalla was arranged by Severus who sought to cement his bond with Plautianus. Caracalla detested his wife, who is said to have been an arrogant and presumpious person. He put up with her with difficulty, and hardly waited until his father�s death to divorce and exile her. His hatred must have run deep, however, for shortly thereafter had her murdered as well. Mints: Laodicea ad Mare, Rome. List all Plautilla coins in the Catalog.